Hi guys! You know I am a sucker for Fred & Friends products. Guests attending a dinner party at my home, inevitably ask my where I got what and usually it’s all items from Fred & Friends. I love their clever products that take ordinary items to another level. 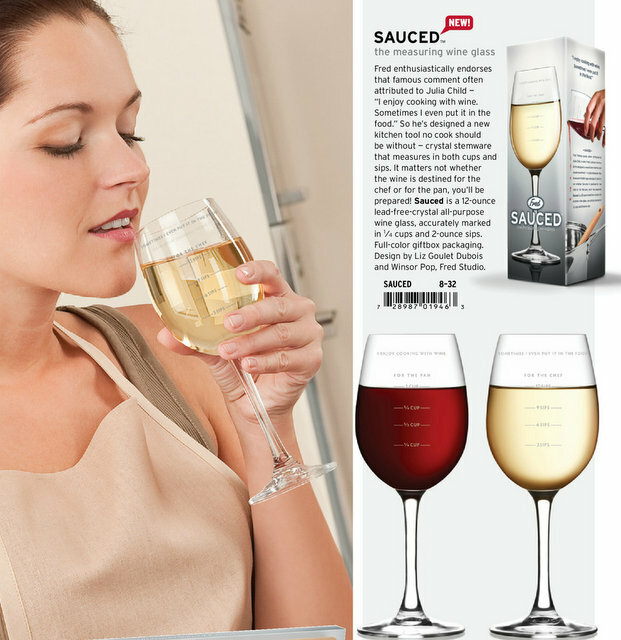 Right now I am dreaming of this Sauced Measuring Wine Glass – it’s perfect for the OC wine drinker haha! The Sauced wine glass is 12 ounces, and is made from lead-free crystal. The top of the glass sports an excellent quote from the great chef Julia Child – “I enjoy cooking with wine. Sometimes I even put it in the food.” I’ll drink to that. I SO want one. I love having a glass of wine while cooking – it’s a wonderful way to cook haha! This is going on my wish list! Love this! So perfect 🙂 Do you order these things? Hi Joey, I haven’t tried! I’m afraid it might break. =( I usually find tons of Fred & Friends products in Manila in this light fixtures/home furnishing shop in the top floor of greenbelt 5. I think it’s starts with a letter D – it’s my favorite place to shop for gifts. It’s strange and unexpected because this place literally sells lighting & chairs. They even have 2 shops on the same floor. But Fred & Friends products are so much cheaper there!